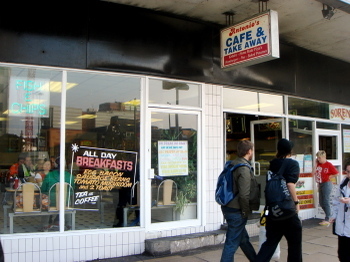 Antonio's is right next to Piccadilly Station in Manchester, so if you start your day with a big fry-up at the Double Six you could hop on the train and have lunch here. Or vice versa. 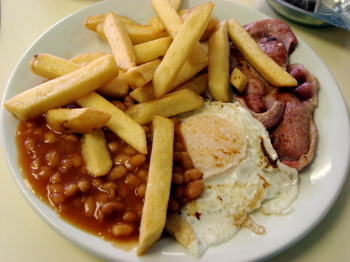 You cannot beat a fry-up like this. I like way the chips are scattered as though they've been dropped from a plane. The bacon has a splendid industrial quality and the egg is nicely mottled, as though with age. And I like those dark and gorgeous beans. 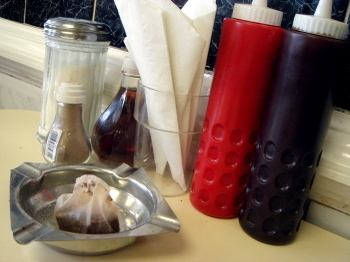 Excellent condiments, reaching for the sky. The sauce colours are for indication only. You wouldn't eat ketchup if it was that red. But you know which one the ketchup is in. 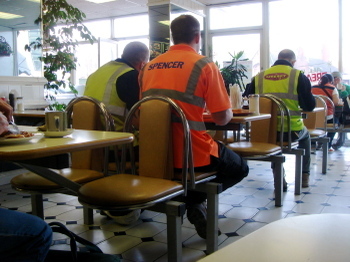 A high density of high visibility vests is always a good sign. 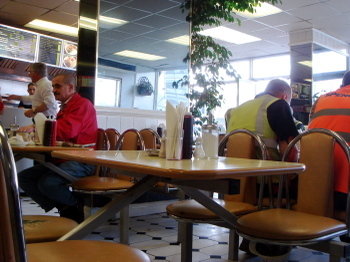 These men know a good cafe. Fantastic signage at Antonio's. Slightly non-traditional spelling to upset the purists but I think it's a sign of character. Maybe all the asterisks are there to offset the spelling. Toasted dishes. 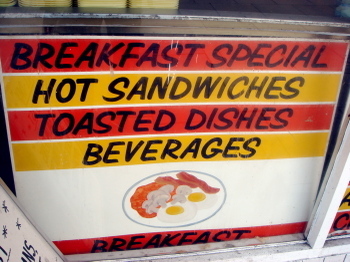 I want Toasted Dishes. Well, I can't comment on the quality of the EBCB here, but I can say with some conviction that this place does without question the worst pizzas and kebabs it has ever been my drunken misfortune to experience. I shudder even now, several years later at the thought! this is all well and good sir, but is the meat free range and the beans organic and the coffee fair trade? 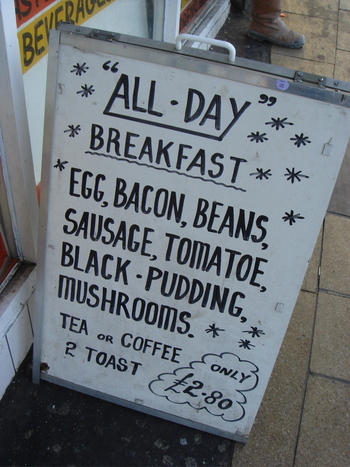 Just looking at the signboard made me hungry..I guess the asterisk made it more attractive and enticing to look..
My partner adores breakfast, but I'm a little squeamish just about the eggs, so don't even get me started on whether beans have any place on a breakfast plate. Found you some nice vintage pictures. Enjoy! I had the All Day Breakfast and it was really nice. It was also nice that I could have it at 7am when nearly everywhere else was closed.